London and shopping go together like two peas in a pod. Like most capital cosmopolitan cities London has a diverse array of shops for all tastes and budgets. One of the most pleasing things to do if you have a free moment or two is to explore the wonders of London’s markets where you’ll see everything imaginable for sale. Whether it’s antiques you fancy, exotic spices, or cut-price bargain clothes there is a market for you. Here’s your own personal guide to the ins and outs of London’s best street markets. You know you’ve hit Brick Lane when the colours start to dance in the streets and you can see endless rows of funky wares for bargain prices. Brick Lane Market is a bargain hunters dream with second-hand, previously loved vintage inspired clothing and accessories. If you don’t intend on buying anything, it’s still worth the visit to see people passionately rummaging around in the stalls looking for the perfect ensemble. This place is full of energy and teeming with people from all walks of life – if you don’t mind a bit of pushing and shoving while fighting over a much coveted garment, head down to Brick Lane and test your haggling skills. One of the more well-known markets of London, this market place has made its name for itself. Situated in the centre of Camden town once the favourite haunt of the late Amy Winehouse, this is one of the best markets to find those exquisite one-off true vintage pieces. Open 7 days a week for your convenience,[pullquote position=”right”] almost anything can be found from Caribbean spices, to reggae music, to bongo drums to even pearl drop earrings[/pullquote] dating back centuries ago – market goers love Camden for the vibrancy, eccentricity and the diversity. Make sure you reserve at least half a day to make your way round every stall and be sure to bring plenty of cash as there’ll surely be a lot to buy. 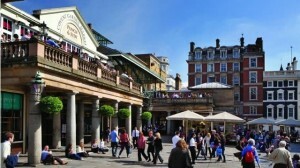 All visitors to London must go and see the bustling Covent Garden marketplace. This beautiful 19th century piazza is made up of three completely different markets and you can find anything that you can imagine. If you’re particularly looking for British crafts be sure to stop off at the Apple Market where you can by exquisite jewellery, handcrafted pottery and charming antiques. In this quirky market place you’ll be able to shop till you drop, experience a cool café culture and be entertained by the numerous street performers who perform anything from magic to opera. Covent Garden is a shopper’s paradise! Fine authentic antiques can be picked up at most London markets, however, if you’re an antique collector or lover of old things Portobello Road Market offers the best range of antiques, all genuine and at reasonable prices. This can be [pullquote position=”right”]a fun place to test your bargaining skills as stall owners expect it and are waiting for a fun battle of haggling[/pullquote] to begin. Make deciding on what trips around London to do when in London you should make a marketplace a priority. Even if you have no intention to shop the atmosphere is phenomenal and you’ll love every minute of it.